get that Korean glowing, plump & moist skin! Cremorlab is a Korean skincare product that has found its way into the hearts of many Korean beauty bloggers. It's potent star ingredient T.E.N (Kim Jin mineral water) is from the mineral rich Geumjin hot springs on a small fishing village hidden 1,100 meters underground. According to legends, a cure-all. Clinical trials shows that the spring water contains more than 10 different rare minerals. The minerals has the ability to help the skin absorb the nutrients calcium, magnesium, potassium, and enhance skin elasticity, and contains a potent antioxidant high in concentration - vanadium and germanium. 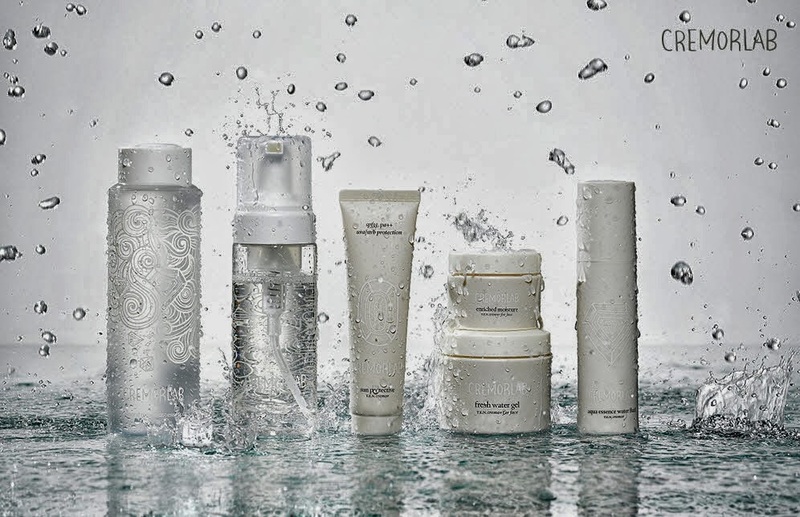 This has given birth to a cosmetic line with exceptional hydrating powers and even the government has granted the brand exclusive rights to the country's hot springs. what's in T.E.N. the star ingredient of Cremorlab? The benefits of T.E.N? Clear, translucent skin and enhances firmness by eliminating reactive oxygen species. If you're looking for glowing, super moisturized, babylike skin - trademarks of Korean girls with "chok chok" (meaning plump and moist) cheeks, then Cremorlab could be your Korean dream come true. For those who takes a great deal of concern on harmful ingredients in their skincare, rejoice as Cremorlab contains no paraben, no mineral oil, no paba, no petrolatum, no benzophenone and no artificial coloring. Benefits: Purifies and refreshes skin. Oxygen bubbles thoroughly cleanse and energize for brighter, radiant skin. Utilizes antioxidant-rich properties of acai berries. After completion of basic care, Apply evenly on the surface. Benefits: Provides a boost of hydration to the skin with T.E.N. thermal water, Preps the skin for the rest of your skincare regimen. 5-in-1 total solution for firmer, revitalized skin. this is their best seller!!! fresh water gel me want! I find you so cute, let me touch you please! 5 Cremorlab Hampers worth RM280 to be won! F.Y.I I have only begun to try the products so I won't be including my review here. I hope my introduction on Cremorlab is informative for those seeking Korean skincare products that is affordable and great in quality to achieve that "chok chok" Korean beauty. I do hope while waiting, you can indulge in a lil' giveaway from me thanks to Muse by Watson. Start clicking on the rafflecopter below and do complete all registration tasks needed. Winners who do not complete these tasks will have to be forfeited. This giveaway starts from now until 6th July, 2014. Yes you must leave a comment here! (the question is in Rafflecopter). Experience Cremorlab at Muse by Watsons with complimentary skin analysis and Cremorlab samples (valid until 30 June 2014). 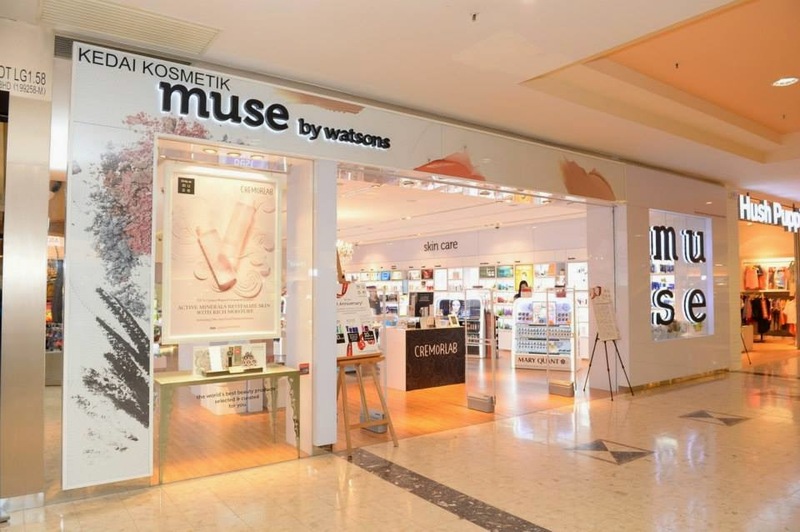 Cremorlab is available at Muse by Watsons, a premium beauty retail brand established by Watsons Personal Care Stores Sdn Bhd in the year 2013 in Sunway Pyramid. The store housed 12 exclusive brands and cosmetic products for both women and men of all ages. Muse by Watsons also offers personalized services by professional beauty consultants, qualified skin specialists and well-trained nail color service assistants. wah! The Texture of the BB Cream macam very smooth eh! I want to win this because I want to make my skin look perfect! Wee Wee Wee! Yeah :) macam chocolate milkshake hor..
1) I am a huge huge mask freak!!! GIVE ME THE MASK!!!!!!!!!! :D I'm a big fan of masks too and their oxygen bubble mask is so fun!!! boink boink skin sounds so cute! 1) honestly..i was attracted by 2nd picture of your blogspot.Before i continue reading it...I already knew it was something to do with purfying...moisturizing clean! I believe most of us are facing major face breakout issue like mine!I hope the HYDRATING MINI KIT can helpme reboost by skin moisture. 2) I dont wish to expose my bare face without any protection under the sun nowadays! I really wish to win the .CREMOR LONG-LASTING PERFECT BB. 3) who doesnt want a T.E.N. CREMOR O2 BUBBLE ENERGIZING MASK treatment after all day outdoor hard work? I definietly needs them to have my skin healthy, supple, and looking forever energized! thanks for sharing such a lengthy why! :) and btw congrats for the tiny one yah! In a nutshell, fabulous reason haha! All the best when giveaway ends yah! Thanks tammy for the giveaway! thank you for joining Izzah! OH you're like me. I have sensitive skin too. Thanks for joining my giveaway and good luck! The weather has been seriously hot so I definitely need moisture back into my skin. Any product raved by Korean bloggers would definitely be at the top of my list of things to try! My dry skin has gotten a lot worse lately so cremorlab products may just be the thing my skin needs. That's why I really want to give these products a try! I feel the same way as you do Rachel! 2) I never had any bubble masks while I heard it is good. My skin needs it!! I wish upon the stars that my name will appear soon, my skin is screaming, it is dehydrated and it needs a Cremor-ly saviour! You never try bubble masks before? oh gosh you're missing out the fun! yeah mamasan, that is the sad truth of my life. never tried any bubble mask at all, fate hasn't arrived yet with my first bubble mask. could this be the one? hehe! I want to win to win Cremorlab hamper to help me achieve korean's porcelain-like skin ! here's to achieving Korean Porcelain like skin! good luck to you my dear!! I wanna win this becoz i always love to try new skincare / makeup products to look better each day! hehe ~ So glad that malaysia have all these brands now! The brand is kind of new to me but it looks so awesome that I need to get my hands on it! It's new to me too :) and I'm glad I got to know about it. Thanks,Tammy for this giveaway! I have been hearing a lot about Cremorlab. So I would really really love to win this so I can try it out! Plus with my skin becoming drier thanks to the hot weather now, I need the much needed moisturizer. Get well fast, I'm sure Butterflies and Caterpillars want to have fun with you! I've been waiting for this ever since Tammy starts to post this on Facebook !! I keep search about this product and I really really want to try and experience the miracle myself because I really have a little skin problem right now. I want to try if this product suitable for me and I really really really want a perfect skin tone and texture! I want to win this hamper because I've become so obsessed with studying the routines of the most skin-conscious women in the world: the Koreans. They have such flawless, dewy & supple skin! I'm currently using Avene's spring mist and would love to try this a cure-all spring water that contains more than 10 different rare minerals!! Haze is here and can tammy please grant me some awesome possum spring water to cure my dry face?? I have been always wanted to try Cremorlab products! This is the only brand which attracts me when I visited MUSE last time. People raves about the Cremorlab Frsh Water Gel, the texture is good and cooling, it would be so suitable for my skin type (super oily) and the weather. I m in love with the packaging, simple and sturdy container, with cute drawings, classy and attractive! I want a healthy glowing skin and I believe Cremorlab is the key to it. Hydration fix every skin problems. By the way, the O2 Bubble Energizing Mask is so special, oh so soft and dense foam-type mask. 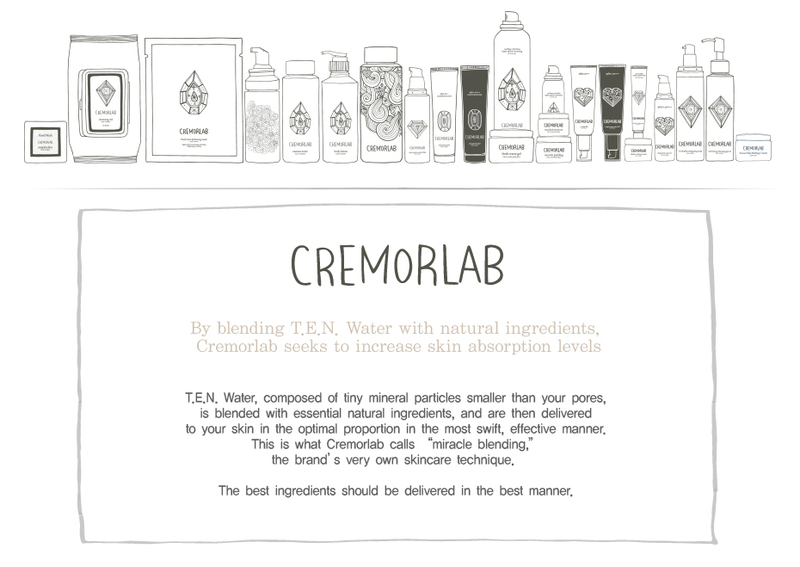 Cremorlab is so popular amongst Taiwanese bloggers that I thought that the brand originated from Taiwan at first. Dying to see what the fuss is all about, and at the same time, hopefully I get to vanquish dehydration. Omg! I really want to win this! I want to have the supple 'chok chok' skin like Koreans. ;) haha. Cermolab products also free from paraben, articificial colouring and any other ingredients that could irritate my sensitive skin. Bonus!! i want to try cermolab because i know this brand from my favourite youtuber michelle pan and finally i have a chance to try this brand from winning this. i hope i can try whether this product suitable for my skin or not, if it is then i gonna go and buy it at muse. I want to win Cremorlab goodies because my skin needs spring water to absorb the nutrients calcium, magnesium and potassium. I've never tried any hot spring before and yes, my skin deserves to own it! Who doesn't want a nice glowy moisture skin?? Moreover, the word "Korean" did make me feel to own it more so Cremorlab is definitely a trustable brand! Thank you for having the giveaway yo! I would loveee to win Cremorlab products as I am currently looking for a good range of skin products that will suit my skin, and I believe that Cremorlab will be able to do the job well. :) Furthermore, the packaging is really pretty! I want to win as in my here did not has Muse by Watsons so I cannot buy Cremorlab for a try. Please let me try the product, been search for a suitable product for my skin for some time. I want to win Cermorlab because I have heard a lot of people say it's good. Too bad Penang does not have Muse by Watson. Just wanna try my luck here to see if I get to win free stuffs or not. Also, I've never had a set of facial or face product. Hope I get to win these and have a better skin! I love that there are only good things in these products and I've recently come over to the side of Asian skincare. It's so intriguing and I would love to try it all out for myself! As you know, I am a skincare junkie and these products have my addiction in overdrive! I want to win Cremorlab goodies because I want my skin look better just like Koreans. I never try this products before but its sound great. I think I'll get shock after using it. Why? Because it's amazing! Totally out of your expect! I want to win the Cremorlab hamper!! OMG Mamasan! I was so excited to see your giveaway!! 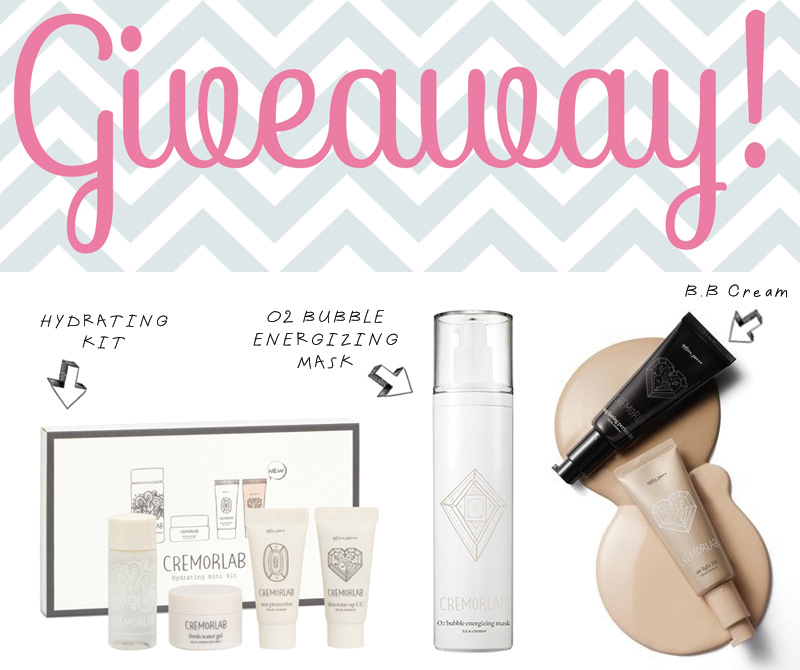 I would super duper love to win this Cremorlab goodies as I'm super obsessed with Korean cosmetic products! Would love to have great skin, hydrated and flawless like all those Korean actresses!! Can't wait to try out the Cremorlab products especially the long lasting BB Cream and the hydrating kit!! Need some hydrating mask for my dry skin. I believe Korea products will not have a issue on my sensitive skin. Would like to try and prove. P/S: Let others to join for the giveaway! I wish to win the Cremorlab goodies because I'm getting marry soon. I wish i can be pretty on that important night. I wish my husband to kiss on my watery cubby face!!! I really really love to try Cremorlab because I like something mineral. Haha! waahh. Cremorlab products looks superb! simple & clean design! me likey! Have u seen the hydro plus range? the name damn cute sial. hydro plus snow falls! feels like buying the whole set already! teehee. but sadly why they no range for oily skin! probably korean skin too good edi. all they need are either moisturising or whitening LOL! Anyway, I would really wanted to try this product and see if it's suitable for my skin condition right now, or not. I really hope that this product could actually help me in clearing some of the skin problems that i am having currently. Plus, Michelle Phan is also using this product and she has been loving it! She purchased a lot of Cremolab during her trip to Korea! I am intrigued by the products that shout the natural ingredients, let's see how well they suit my skin. I'd love to win this Cremorlab set because I've tried the sample sizes from the Bag of Love and love it because it's so pure and hydrating. I want to win Cremorlab goodies because I want try this product and review it in my blog. Thanks Tammy for this giveaway. I want to try Cremorlab products as the packaginglooks so sleek and cute at the same time. I'm eyeing the BB cream and foam mask. Every type of skin needs hydration and since the T.E.N is all about adequate hydration to the skin, I would love to try on Cremorlab! I want to win because I need all the hydration I can get rid of my dry and sensitive skin! I want to win this hamper because I want flawless skin like Koreans and sadly my consultant says my skin is dehydrated now :( Hope this Cremorlab can solve my problem! I want to win myself a set of Cremorlab because I fall in love with the T.E.N Benefits. I love the way they used natural sources which is Kim Jin mineral water from the hot spring as their main ingredients. When I read your entry line-by-line, I can feel their cooling and fresh sensation made by the pure mineral water. I think this set will help me in reducing my dull skin and refresh my skin textures. Furthermore, their O2 Energizing Bubble Mask capture my eyes! It is a unique product and something new. I can't wait to try it out and I believed Cremorlab will give me one awesome experience! Hey Tammy! I would like to win because I have never tried Cremorlab products before and I always heard good review on it! Kim Jin Mineral water is really special and I really wish that I can have a chance to try it out! Thank you so much yo Tammy! very cool. i would love to try! Thanks for the giveaway! I hope to win Cremorlab cause i wanna try it out! Weather been very hot lately and my skin very dehydrated, i want back my boink boink skin by using the hydrating kit and mask!! Besides, i wanna try if the BB Cream suits me or not :D.
I want to win Cremo Lab goodies because I recently became a skin care addict. From Cremo Lab's ingredients and having that it's from Korea, I believe and look forward to having flawless and healthy looking skin like the Koreans :). Hi Tammy, I would like to win Cremorlab products because my skin have been misbehaving lately. It's oily and dry at the same time, since Cremorlab products are highly raved about, I would love to have a chance to win it to try tame my skin. I hope I can win! Never heard of this brand before but it surely looks good! I want to win because i want "QQ" and "sui sui kut kut" skin for my sensitive skin. I want to win Cremorlab Goodies because the BB Cream flawless and smooth feel like our second skin. I want to win a Cremorlab hamper because their products sounds awesome with great ingredient! I want to have perfect & flawless skin! I hope to win Cremorlab because I would like to enjoy the benefits of T.E.N to make my skin flawless translucent, glowing, even more-toned, moisturized with firmness with elastic feel. I feel free & comfortable because it’s 6-NOs: no paraben, no mineral oil, no paba, no petrolatum, no benzophenone and no artificial coloring so it will not be a burden for me. I really want to try the O2 Bubble Energizing Mask... although such product has been in the market, i haven't get my hands on it yet! I want to win Cremorlab goodies because the goodies sounds so fantastic in Tammy's blog and I really eagerly want to try it out! hope can win this Cremorlab goodies. really want to try them. I hope to win Cremorlab because this products known as 6-NOs, the stem cells work effectively on anti-aging. It’s formulated with very mild, gentle & non-irritating to my sensitive skin+eyes. It revive my skin by nourishment, moisturize & intense hydrate to make it healthier & youthful. So my skin will be optimal rejuvenate. With daily usage, I’m sure I’ll surprised others with my more even-toned skin with bright & radiant charming looks. I would like to try Cremorlab as I want to give my skin some gentle skincares after using chemicals products without a thought to my poor skin and health. I really want to win this because I have fallen in love with their T.E.N. Cremor for Face Fresh Water Gel 10ml :DDD i do hope they sell it in full size because it's really awesome! I want to win this because i have always adore the Korean super clear and translucent perfect *doink doink* face. I want to have perfect skin also. I have always suffer from breakouts due to super dry skin and the hydrating kits sounds like it can give my skin all the moisture and nutrients it need! I also have uneven skin tone due to acne scars and the perfect bb cream can help to cover my *not-so-perfect* skin. Lastly, the energizing mask can help me sustain my youthful, they say it's never too early to start on anti-aging. It's women's lifetime homework. Best of all, Cremorlab products has no paraben, no mineral oil, no paba, no petrolatum, no benzophenone and no artificial colouring, which means people who have super sensitive skin like mine should be able to use it without worry. I really hope to try this to achieve a better looking skin. Been switching products for years ever since my first breakouts in my teen age and I have yet to find the perfect skincare for me. I hope cremorlab is the saviour to my skin. My dry skin really dehyrates all the time and i hardly use mask and sometime i even forgotten to apply it consistenly. Always awake during for night feeding and i seldom taking care of skin with lack of moisture and energizing mask. I do hope with this Korean product will lift up my skin become more glow and looks better hyradte with healhty face. Attracted to this Mineral Treatment Essence which provides a boost of hydration to the skin with T.E.N. thermal water, Preps the skin for the rest of your skincare regimen. 5-in-1 total solution for firmer, revitalized skin. Sounds really good and suitable for my needs. I've been using Korean brand bb cream all this while, would really like to try cremorlab's too! Just so attracted by the Perfect BB Cream! Looks so cool! Ohh...I need Cremorlab Skincare badly to rescue my skin. I want to win these skincare products because I want to obtain babylike skin! Getting older day by day cause my confident lesser day by day even bf said I'm not young as first he met me. So I must work harder to make myself younger than before! As not much of beauty skin product can do like this! It helps to hydrate the skin with T.E.N. thermal water, Preps the skin for the rest of your skincare regimen. 5-in-1 total solution for firmer, revitalized skin! Hope Im the one of the 5 lucky girls that can try out these! I heard a very good review about this brand. In fact, cremorlab is also Michelle Phan favourite!!! She shared with us how marvelous this products works for those with dry skin condition. Since that I have a very dry skin, I hope I would be one of the lucky 5 to win and own cremorlab for my skin care routine! Please consider me!!!! Thanks tammy and muse watson for the giveaway! I want to win this give away because I am too broke to buy new products that doesn't suit my sensitive. Recently my face always break out whatever I try or used product from counter or natural ways from internet. Hopefully, this product will help to regain back my smooth face. I will do anything will takes to help me beautiful again. 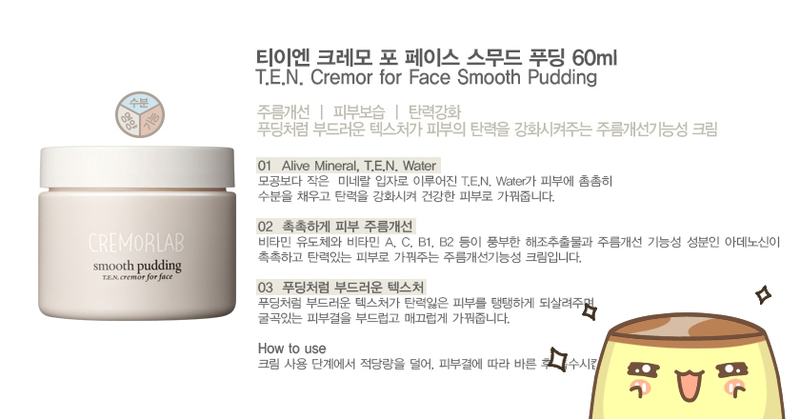 I want to win this giveaway because I want to try all their products including the T.E.N Cremor For Face Smooth Pudding! I've read so many good reviews about it but couldn't get myself to try it just yet. Hopefully I can get my hands on this superb product! I want to win this giveaway because i love how innovative the idea of these product.The ingredients are highly sophisticated and beneficial to my skin.Plus the clean and sleek packaging with the diamond and heart shaped graffiti really catch my eyes! I believe Cremorlab stands on the same level as other Korean high end brand such as Laneige and Iope based on its price and i would love to try the alternative to these brand.Hopefully i will have the chance to win this giveaway! I hope to win this away! I hope to win the Cermolab! This is awesome!!!!! 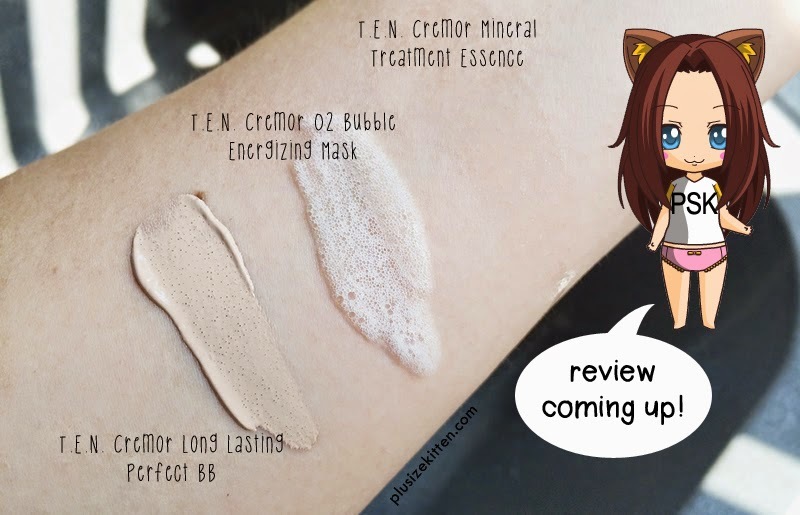 I hope to win Cremorlab because I believe in Cremorlab philosophy 'the miracle blending' technique blended with T.E.N., water composed of tiny mineral particles and essential natural ingredients and giving the powder of fast skin absorption and this definitely will do wonder and giving WOW effect for everyone skin and also the 6-NOs: no paraben, no mineral oil, no paba, no petrolatum, no benzophenone and no artificial coloring are the extra benefits for my skin. I want to win this giveaway because it contains Geumjin hot spring water & NO harmful ingredients, and I believe it will works well on me! I want to win the CREMOLAB giveaway because I want to try Korean Products. I've heard positive feedbacks about Korean Skin Care and I want to try it myself. I wanna try this out because I'm always impressed by skincare that has scientific research and effective ingredients as background. And I wanna try it on my own skin to confirm their effectiveness! I want to win this because I want skin that goes "Boing Boing" ! or is it really 10ML for RM119?